You need to engage first gear for a good fifteen minutes as you climb up the mountain leading to Leshiba Wilderness lodge. At the top you arrive in a hidden valley amongst the Soutpansberg Mountains where you will quite often be walking above the clouds. Experience some of the most dramatic scenery South Africa has to offer and the unique venda culture whilst staying at this small funky lodge. It is unlike anything else in Africa: family-managed and offering a really African experience, with comfort and warm hospitality. Star-gazing, riding, game viewing, massages, biking, rock art and a mystic retreat are all available. Leshiba is in the less well known Limpopo province. 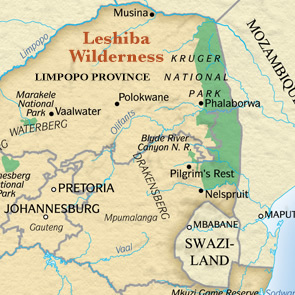 A ten-day self-drive itinerary with accommodation at four different lodges in this area, including Leshiba, costs from £2,900 per person including flights. Definitely the road less travelled and inexpensive. 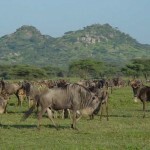 The short grass plains of the southern Serengeti are the ancestral home of the wildebeest. Millions of years ago tons of ash were dumped here by volcanic activity, giving rise to phosphate-rich grass plains, which are perfect feeding grounds for these rather pre-historic looking gnus. The herds can’t stay here all year as the grassy terrain becomes exhausted, so they move off en masse on their migratory paths in search of fresh grazing, thus providing one of nature’s great wildlife spectacles. The Serengeti is always in a state of flux. My favourite mobile safari operator can take you on a journey to see this spectacle. If you book by the end of October there is a stay four, pay three nights offer for some of the high season in 2014; or go in the low season when the prices of their camps are nearly half the normal price. 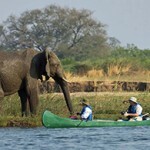 …is the only requirement needed for this journey that focuses on the mighty Zambezi River. Whilst canoeing down this iconic river you will pass countless hippo, get close to ellies coming down to drink, and camp on the banks of the river. This three-night mobile is fully backed up with guides and camp attendants to look after you. No visit to the Zambezi is complete without a visit to the mighty Victoria Falls, and the itinerary includes a stay here. Check out bungee jumping, white-water rafting, heli rides, microlite flights and elephant-back rides. The third part of this Zambezi odyssey is on the shores of Lake Kariba, where you stay in a remote and small tented camp set in this watery wilderness. This is definitely one of the most beautiful landscapes in southern Africa. It is a big five area, and fishing in the lake and hiking are offered. A ten day itinerary including flights from £3,900 per person. 2014. Please call for further details on these holiday ideas. 020 7723 5858.